The five newly elected women, all Democrats, who helped their party regain control of the Colorado Senate, from left: Jessie Danielson holding daughter Isabelle Beth Kabza, Kerry Donovan, Brittany Pettersen, Tammy Story and Faith Winter. Colorado’s House of Representatives is in an exclusive club. It’s one of only two legislative chambers in the country where female lawmakers hold a majority. Overall, women make up nearly half of the state’s 100 lawmakers. The growing involvement of women in politics is often credited to a backlash against President Donald Trump – but the trend started much earlier here. In 1894, Colorado elected the nation’s first female state lawmakers in three Republican women. However, these days the gender gains mostly happen on the other side of the aisle. 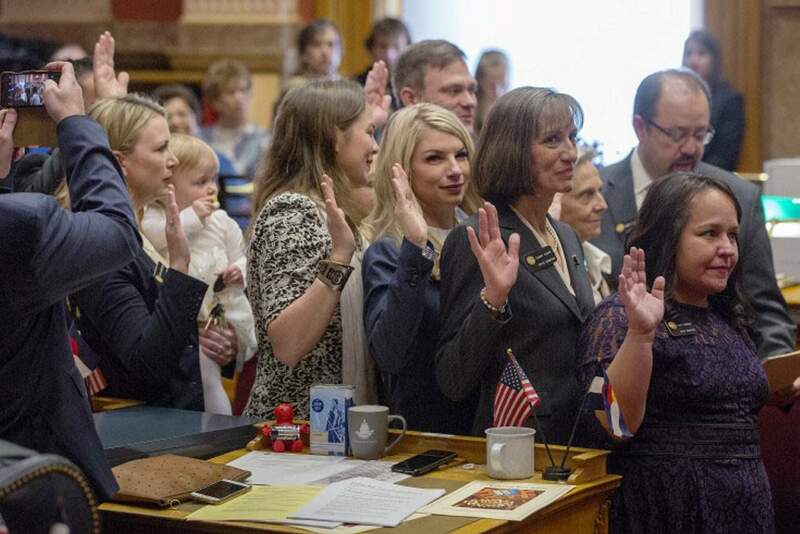 When Democratic Rep. Meg Froelich was sworn in to fill a vacancy left by a male colleague who moved to the Senate earlier this month, she helped cement the chamber’s new female majority 34 to 31 – 26 of those women are Democrats. Overall, the Democratic majority is 41 to 24.